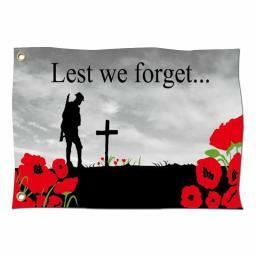 On our Remembrance Flag you will find an inscription with the phrase ‘Lest We Forget’, along with the image of a solitary soldier standing at the grave of a fallen comrade. On the bottom left and right-hand corners there are poppies, which are important and widely recognised symbols attributed to Remembrance Day. 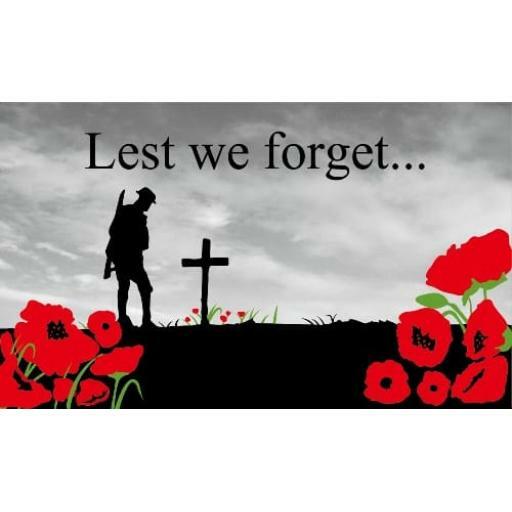 The poppy symbol, along with the term lest we forget, became popular symbols and terminology during the aftermath of WWI. Today, we have combined them in this Remembrance Flag design, which is the perfect accessory for any memorials, ceremonies, parades, and displays.